In November 1948 Picasso painted two slightly dif­ferent versions of The Kitchen, both monumental, monochrome, and virtually abstract. In her memoirs, Francoise Gilot tells the story of their making: "Pablo executed the first version of a large-format painting called The Kitchen, which was inspired by the kitchen at the Rue des Grands-Augustins in which we sometimes ate our evening meal. The room was painted all in white, and, apart from the usual utensils, there were two birdcages in it. The only accents of colour were the three Spanish plates hung on the walls. The kitchen was basically an empty white cube, enlivened only by the birds and the colourful plates. Pablo told me one evening: 'I am going to make a painting of that - that is to say, of nothing.' And that's exactly what he did. He drew a network of lines to structure the space and added a few concentric lines to create target - like shapes - the Spanish plates. In the background one could just make out the owl and the turtledoves. At this stage of the work he looked at the canvas and declared: 'I now see two possible directions for this canvas. Let's make a second version of it, exactly the same, and I will take it from there.'" The first version, the simplest and most extreme, was thus little more than a linear framework o­ganizing the space. 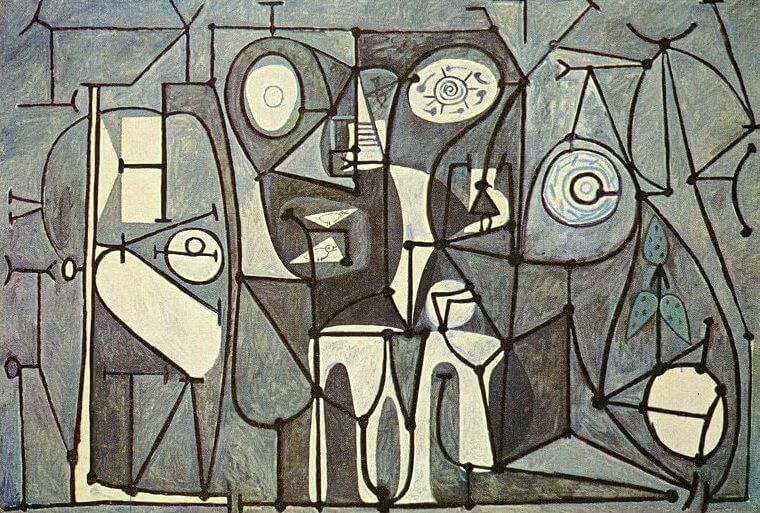 Picasso, however, felt the need to give some pictorial nourishment to this rather dry composition, and in the second version, he added coloured details such as the succulent plant on the right, the patterns of the plates, and the silhouettes of the three birds with the cage. Within and behind the framework of dots and lines he added splashes of colour whose shape and arrangement give depth and relief to the picture. The lines are independent of the background; they create a surface pattern that rhythmically articulates and contains the spatial tension. "Form", Picasso liked to say, "is a hollow volume against which the outside pressure is such that it produces the appearance of an apple .... It is the rhythmic pressure of space on this form that matters. "